I don't have words to describe how much I enjoy eating these Golden brand Potato Pancakes. They are unbelievable amazing and are only 1-2 WW points (70 calories each, right on the edge between 1 and 2 points), making a great low calorie snack or low calorie side dish. After you heat them up (I've heated them both in the microwave and in a pan with PAM), you can put some fat free sour cream on them (which I just blogged about) for only a small amount of added calories. The potato pancakes are so delicious that I can eat them without feeling like I'm dieting. 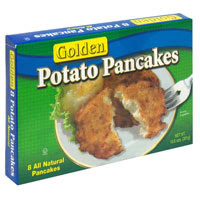 I buy the Golden Potato Pancakes at Whole Foods, but unfortunately I haven't seen them anywhere else. Please post if you have found them (or anything like them) in your local grocery store. I hope you enjoy them as much as I do. Let me (and everyone else) know! I've never had the veggie ones. Sound delicious. I will keep my eye out for them. I've found them at Costco in NJ. There were 24 in the package. I didn't like them at all. Bummer. I absolutely love them! I wonder if they had been frozen too long since they were at Costco. Streits makes a Vegetable Potato Pancak Mix in a box, with 2 separate packages, in case you only want to make a few. These come direct from New York City. To die for!!!! If you like these - Dr. Praeger's makes unbelievable potato pancakes (2 pt.) and broccoli pancakes (1 pt.). I found the Golden brand in the Frozen Food "Ethnic" section of Publix in South Florida. Both the original and the sweet potato pancakes are great - we prefer them with applesauce.